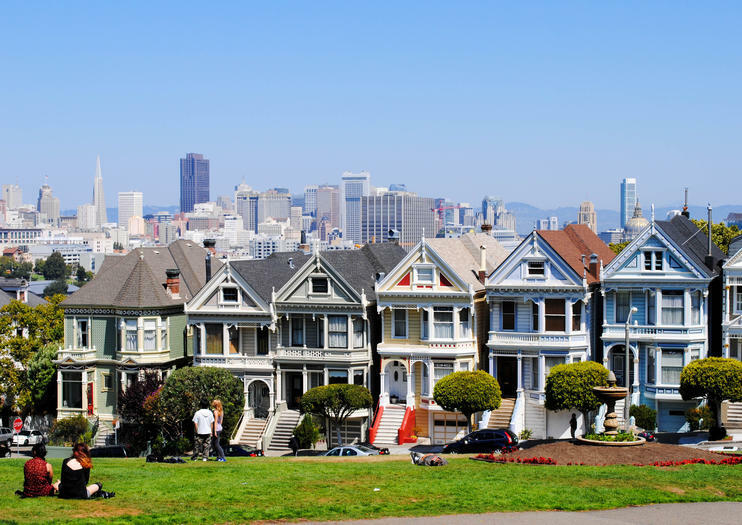 Two days in San Francisco are enough to visit its main tourist-circuit sights and the neighborhoods that give the city its undeniable character. There’s also time to heed the call of the bay, with Alcatraz and Sausalito luring urbanites across the water. Here’s how to maximize two days in SF. Morning: Start today near Union Square, a central spot with easy access to iconic areas and attractions such as Chinatown, Grace Cathedral, and the St. Francis Hotel. A cable car ride takes you through cosmopolitan and old-school neighborhoods at a leisurely pace, while hop-on hop-off bus tours allow you to see more attractions in less time—some even go across the Golden Gate Bridge. Afternoon: For low-key exploring on your first afternoon, culinary or cultural walking tours let you easily get to know San Francisco neighborhoods with local expertise. North Beach and Chinatown are the main players, but if you’re ready to venture farther out, head to the Mission, where you’ll find multicultural cuisine, eclectic shops, and beautiful alleyway murals. Night: San Francisco has all the nightlife offerings of a world-class city. Edgy crowds congregate in Lower and Upper Haight, while the cool tech kids meet Burning Man types in SOMA. If around on a Thursday, it’s worth prebooking admission to California Academy of Sciences’ adults-only NightLife events, which offer music and cocktails while visitors explore the museum after hours. Morning: Your second morning is a perfect time to venture out onto the bay. Early-access Alcatraz tours should be booked well in advance, as they let you explore the infamous island-prison before most crowds arrive. If you get started early enough, you’ll have time to celebrate your morning accomplishment with a champagne brunch bay cruise afterward. Afternoon: For lunch, take a ferry to Sausalito, a charming bayside town full of shops and galleries across the Golden Gate Bridge from San Francisco. Muir Woods is another popular destination north of the city, offering an urban escape with old-growth redwood groves. Some tours visit both Sausalito and Muir Woods in a single afternoon. Night: There is no shortage of memorable ways to spend your last night in San Francisco. Dine and dance to live music on an evening bay cruise, or choose a more casual nighttime bus tour—some travel in Volkswagens decked out in hippie gear, while others stop for illuminated city views from urban gems such as Treasure Island or the Presidio. Ride a double-decker sightseeing bus to San Francisco's most famous landmarks with a choice of 3 different passes. Explore the city's 49 square miles, including stops at big-name attractions like Pier 39, the Palace of Fine Arts and Union Square. Go at your own pace, hopping off at any of 24 stops, exploring at your leisure, and then hopping back on when you're done. Your ticket includes a walking tour of Chinatown. Choose the Premium or Deluxe pass for additional upgrades including a night bus tour or a trolley tour in nearby Sausalito. Visit Alcatraz Island before most visitors arrive and tour San Francisco on a motorized classic cable car. You’ll head to Alcatraz early to enter this National Historic Landmark District. Explore the former prison via the award-winning audio guide, and enjoy a sightseeing tour of Chinatown, North Beach and the Golden Gate Bridge on a cable car retrofitted with wheels, so you can see more of the city. Spend an evening on the San Francisco Bay with this 2.5- or 3-hour dinner cruise, including a 4-course gourmet meal of fresh, local ingredients prepared on board. After dinner, dance to the live band or enjoy the nighttime views of Alcatraz, the Golden Gate Bridge and the city skyline from the exterior deck. Viator Exclusive: Upgrade to include window seating and a bottle of sparkling wine, an option available nowhere else. Glide across San Francisco Bay with unlimited mimosas and sparkling wine on this 2-hour, weekend brunch cruise. Sail under the Golden Gate Bridge, pass Alcatraz, and see the city skyline from the deck. A hearty buffet and onboard music keep the mood festive while you enjoy brunch and sightsee. Tired of the urban cityscape and feel like you need a breath of fresh air? Then jump on this San Francisco day trip by bus, and visit some of the world's tallest trees at Muir Woods National Historic Monument, only minutes from downtown. One moment you'll be kicking your way past the Golden Gate Bridge and Sausalito, and a short while later wandering beneath the majestic canopy of centuries-old California coastal redwoods. Getting across San Francisco Bay is as easy as taking to the water. The San Francisco Ferry runs one-way and round-trip service to both Sausalito and Tiburon, so rather than worry about traffic, you can sit back and relax while savoring incredible views of the Golden Gate Bridge, the Bay Bridge, and the San Francisco skyline. The bayside towns of Sausalito and Tiburon make great day trips from San Francisco, and each boasts a bevy of boutiques, galleries and restaurants to explore. Linger by the water, enjoy a drink (own expense) or simply stroll along the narrow streets and delight in the surrounding scenery. This ticket allows you to skip the box office line and head straight to the gate. Experience Muir Woods National Monument and the quaint waterfront town of Sausalito on one half-day tour. Travel across the Golden Gate Bridge on a guided day trip that includes pickup in a convenient central location in downtown San Francisco, transportation to Marin, and National Park entrance fees. Enjoy free time among the ancient redwoods, then explore Sausalito at your own pace before returning to San Francisco by ferry. Get a unique perspective on San Francisco by taking a 1-hour nighttime bus tour. See neighborhoods such as Fisherman's Wharf, Embarcadero, Chinatown and the Financial District while listening to commentary from a live guide. Multiple tour departure times available to suit your schedule. Taste an array of culinary offerings in San Francisco's Mission district during this 4-course progressive dining experience. Follow a foodie guide through the historically Latino neighborhood packed with bars and restaurants. Stop at four different restaurants for a prix-fixe menu starting with 2 appetizer stops followed by an entree and concluding with dessert. Along the way you'll hear the stories of restaurant owners and chefs, who will give a behind-the-scenes perspective of the area, while enjoying food tastings. The mission is to help guests experience the world differently through storytelling and food, so you might try a unique dish or experience an old favorite in a new way. So bring a sense of adventure during this fascinating insider tour that's rated five stars on Yelp. Get to know the hippie past and hipster vibe that make up San Francisco today aboard a colorful 1970s-era Volkswagen bus. Enjoy the illuminated city during this 2-hour night tour that takes you to Fisherman’s Wharf, Chinatown, North Beach, the Castro, the Mission, downtown and more. Check out the homes of The Grateful Dead, Janis Joplin and Jimi Hendrix, while listening to ‘60s classics. So dig your shoes into groovy shag carpet and shake some beaded curtains. Each bus accommodates up to just six people.